The knight (♘,♞) is a piece in the game of chess, representing a knight (armored cavalry). It is normally represented by a horse's head and neck. Each player starts with two knights, which begin on the row closest to the player, between the rooks and bishops. Colloquially it is sometimes referred to as a "horse", which is also the translation of the piece's name in several languages. Some languages refer to it as the "jumper", reflecting the knight's ability to move over pieces in its way: Polish skoczek, Danish/Norwegian springer, German Springer, Luxembourgish Sprénger, Slovene skakač. In Sicilian it is called sceccu, a slang term for a donkey, derived from the Arabic sheikh, who during the Islamic period rode from village to village on donkeys collecting taxes. The black knight may move to any of eight squares (black dots). The white knight in this case is limited to two squares (white dots). The knight move is unusual among chess pieces. It moves to a square that is two squares away horizontally and one square vertically, or two squares vertically and one square horizontally. The complete move therefore looks like the letter "L". Unlike all other standard chess pieces, the knight can "jump over" all other pieces (of either color) to its destination square. It captures an enemy piece by replacing it on its square. The knight's ability to "jump over" other pieces means it tends to be at its most powerful in closed positions, in contrast to a bishop. The knight moves alternately to light and dark squares. A knight should always be close to where the action is, meaning it is best used on areas of the board where the opponent's pieces are clustered or close together. Pieces are generally more powerful if placed near the center of the board, but this is particularly true for a knight. A knight on the edge of the board attacks only three or four squares (depending on its exact location) and a knight in the corner only two. Moreover, it takes more moves for an uncentralized knight to switch operation to the opposite side of the board than an uncentralized bishop, rook, or queen. The mnemonic phrases "A knight on the rim is grim" or "A knight on the rim is dim" are often used in chess instruction to reflect this principle. The knight is the only piece that can move at the beginning of the game without first moving a pawn. For the reasons above, the best square for the initial move of each knight is usually one towards the center. Knights are usually brought into play slightly sooner than the bishops and much sooner than the rooks and the queen. The knight forks the king and rook. Because of its move pattern, the knight is especially well-suited for executing a fork. In the numbered diagram, the numbers represent how many moves it takes for a knight starting from f5 to reach each square on the chessboard. A knight is approximately equal in strength and value to a bishop. The bishop has longer range, but is restricted to only half the squares on the board. Since the knight can jump over pieces which obstruct other pieces, it is usually more valuable when the board is more crowded (closed positions, and early in the game). A knight is best when it has a "support point" or outpost – a relatively sheltered square where it can be positioned to exert its strength remotely. On the fourth rank a knight is comparable in power to a bishop, and on the fifth it is often superior to the bishop, and on the sixth rank it can be a decisive advantage. This is assuming the knight is taking part in the action; a knight on the sixth rank which is not doing anything useful is not a well-placed piece. A knight is usually worst positioned on the edge of the board. Enemy pawns are very effective at harassing knights because a pawn attacking a knight is not itself attacked by the knight. For this reason, a knight is most effective when placed in a weakness in the opponent's pawn structure, i.e. a square which cannot be attacked by enemy pawns. In the diagram at left, White's knight on d5 is very powerful – more powerful than Black's bishop on g7. Whereas two bishops cover each other's weaknesses, two knights tend not to cooperate with each other as efficiently. As such, a pair of bishops is usually considered better than a pair of knights (Flear 2007:135). World Champion José Raúl Capablanca considered that a queen and a knight is usually a better combination than a queen and a bishop. However, Glenn Flear found no game of Capablanca's that supported his statement and statistics do not support the statement either (Flear 2007:135). In an endgame without other pieces or pawns, two knights generally have a better chance against a queen than two bishops or a bishop and a knight (see Fortress (chess)). White to move cannot win. White wins if Black is to move. Compared to a bishop, a knight is often not as good in an endgame. The knight's potential range of movement is more limited, which often makes it less suitable in endgames with pawns on both sides of the board. However, this limitation is less important in endgames with pawns on only one side of the board. Knights are superior to bishops in an endgame if all the pawns are on one side of the board. 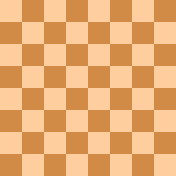 Furthermore, knights have the advantage of being able to control squares of either color, unlike a lone bishop. Nonetheless, a disadvantage of the knight (compared to the other pieces) is that by itself it cannot lose a move to put the opponent in zugzwang (see triangulation and tempo), while a bishop can. In this position, if the knight is on a white square and it is White's turn to move, White cannot win. Similarly, if the knight was on a black square and it was Black's turn to move, White cannot win. In the other two cases, White would win. If instead of the knight, White had a bishop on either color of square, White would win with either side to move (Mednis 1993:7–8). At the end of the game, if one side has only a king and a knight while the other side has only a king, the game is a draw since a checkmate is impossible. When a bare king faces a king and two knights, checkmate can occur only if the opponent commits a blunder by moving his king to a square where it may be checkmated on the next move. Otherwise, a checkmate can never be forced. However checkmate can be forced with a bishop and knight, or with two bishops, even though the bishop and knight are in general about equal in value. Paradoxically, checkmate with two knights sometimes can be forced if the weaker side has a single extra pawn, but this is a curiosity of little practical value (see two knights endgame). Pawnless endings are a rarity, and if the stronger side has even a single pawn, an extra knight should give him an easy win. A bishop can trap (although it cannot then capture) a knight on the rim (diagram), especially in the endgame. In algebraic notation, the usual modern way of recording chess games, the letter N stands for the knight (K is reserved for the king); in descriptive chess notation, Kt is sometimes used instead, mainly in older literature. In chess problems and endgame studies, the letter S, standing for the German name for the piece, Springer, is often used (and in some variants of fairy chess N is used for the popular fairy chess piece, the nightrider). Even among sets of the standard Staunton pattern, the style of the pieces varies. The knights vary considerably. Here are some examples. The knight, along with the king and the rook, has the oldest defined movement of any chess piece, its movement being unchanged since the invention of chaturanga in India around the 6th century. Similar pieces are found in almost all games of the chess family. The ma of xiangqi and janggi are slightly more restricted; conceptually, the piece is considered to pass through the adjacent orthogonal square, which must be unoccupied, rather than "jumping". Another related piece is the keima of shogi, which moves like a knight but may only move two squares forward followed by one square sideways, restricting its movement to two possible squares. ^ Because of this, the move can also be described other ways, such as one square diagonally and one square orthogonally "outward" (not ending adjacent to its starting square), or one square orthogonally followed by one square diagonally outward. The latter describes the move of the horse in xiangqi, which cannot jump. ^ "JeremySilman.com is the web's most comprehensive chess book review site. - JeremySilman.com". www.jeremysilman.com. Wikimedia Commons has media related to Chess knights. This page was last edited on 26 March 2019, at 23:19 (UTC).